Irwin Racing's Thundersport trophy haul continues to grow following another successful weekend competing in the competitive British series. 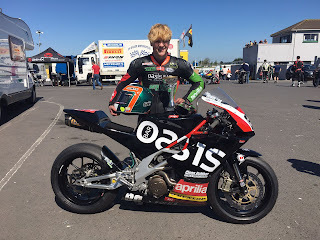 Racing at the unique Rockingham circuit the Oasis Bar Letterkenny and Clean Rubber backed team picked up six more podium finishes with Rhys Irwin collecting four first places from his four races, while older brother Caolán recovered from issues in qualifying to pick up two more trophies. The two young Donegal racers suffered problems in qualifying and it looked like being a tough weekend at the Northampton track. Caolán struggled with his Yamaha Superstock machine in testing and the team worked hard to completely change the set-up for Saturday's qualifying. Despite an improvement with the bike, Caolán was disappointed to line up tenth for Saturday's opening race and knew that further changes would be required. Things were much worse for Rhys as machine issues meant he did not set a lap time in qualifying, leaving him twenty eighth on the grid. Things began to improve straight away in Saturday's first race as a very determined Rhys battled his way into the lead of the Aprilia 450 class. Lapping faster than many of the more powerful Twin machines he was sharing the track with, he took his second class win of the year, along with fastest race lap, on his way to tenth place overall. Starting at the back again for the second race, the Oasis Bar and Clean Rubber backed Aprilia once again blasted through the field to take a second class win of the day, fastest race lap and seventh place overall. With the grids changed for Sunday's races Rhys would line up tenth and first of the Aprilia racers. Having set the pattern on Saturday the team continued to add to their win tally, as once more Rhys took the class win, fastest lap and seventh. The final race of the weekend saw the younger Irwin brother really up his game, cutting a second and a half off his best time, to lap on the pace of the faster Production Twin machines, on his way to victory number four. While Rhys was completing a clean sweep Caolán was gradually working through his issues to get closer to the front. Race one saw him make a slight improvement in lap time over qualifying as he moved up to seventh by the finish. Further fine tuning overnight finally brought the improvement that the team were looking for and helped Caolán to improve further in Sunday's opening race. Following a climb from seventh on the grid he finally got back on the Elite class podium for the first time since his victory at Cadwell Park in May. Irwin Racing will be back in action this coming weekend at rounds 13 -15 of the Masters Championship at Mondello Park before their Thundersport campaign continues at Anglsey on August 27th & 28th.